UDM Downloads > Free OST PST! Free OST to PST conversion software is designed to Convert OST (Offline Storage) file to PST (Personal Storage) file and also recover permanently deleted emails from the deleted items folder. The software successfully works as an OST to PST Conversion software and lets you convert (.OST) file of Microsoft Exchange Server to (.PST) file of MS Outlook. It recursively scans the (.OST) file and then extracts existing emails from the Offline Storage (.OST) file. 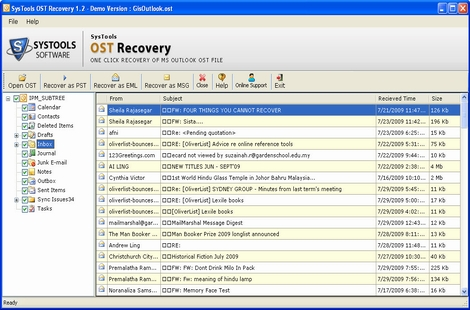 Emails, sent items, drafts, journals, calendar, notes, schedules, to-do list, all are converted by the Free OST to PST software. It also functions as SysTools OST Recovery software and recovers permanently deleted emails from the "Deleted Items" folder. Save the converted (.OST) file in .PST, .EML and .MSG file format and access it with Microsoft Outlook or Outlook Express. Supported MS Exchange Server version for OST to PST conversion include 5.0, 5.5, 2000, 2003 and 2007 MS Outlook 97, 98, 2000, 2002, 2003 and 2007. Demo Version of this software free of cost for user to download and try. License of this software on easy payment only $99 for personal and $199 for business.